Trump reportedly handed Merkel a $374 billion invoice for NATO. President Donald Trump and German Chancellor Angela Merkel hold a joint press conference in the East Room of the White House on March 17. 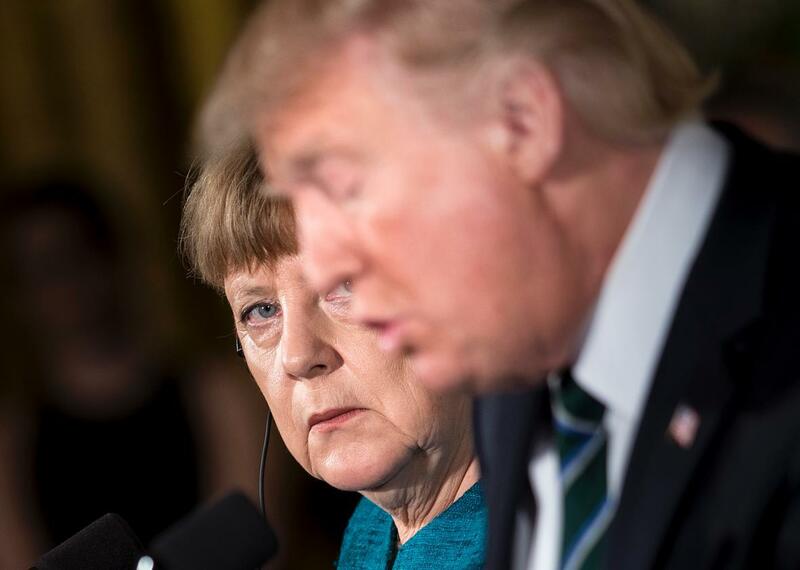 We all knew that the White House meeting between President Donald Trump and German Chancellor Angela Merkel had been awkward. But things were even more uncomfortable than we thought. Turns out Trump’s version of diplomacy with one of the country’s most important allies in Europe involves handing over a bill for billions of dollars that the White House believes it owes NATO, according to the Times of London. One German minister did not hesitate to qualify the invoice as “outrageous,” saying the intent was clear. “The concept behind putting out such demands is to intimidate the other side, but the chancellor took it calmly and will not respond to such provocations,” the minister said. Although no one confirmed how much the total invoice was for, a calculation by the Times suggests the total was around $312 billion for the shortfall in spending and around $62 billion in interest. Trump has long criticized Germany and numerous other NATO countries for failing to spend 2 percent of their GDP on defense, as they had pledged to do in 2014. So how did the White House get to $374 billion? It went further back, taking 2002 as a starting point, noting that was when Merkel’s predecessor vowed to boost spending on defense. “The president has a very unorthodox view on NATO defense spending,” an official tells the Times. That is one polite way of putting it; others have flat out said that Trump’s statements on NATO suggest he really does not understand how the alliance is funded. Merkel reportedly “ignored the provocation.” She appears to be a bit more adept at diplomacy than her U.S. counterpart.